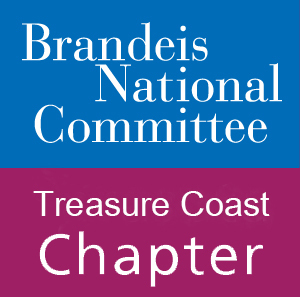 Welcome to the Treasure Coast chapter of the Brandeis National Commmittee! We are a group of men and women from Marin and St. Lucie Counties who are passionate out lifelong learning, our communities, and supporting Brandeis University, whose values we support. This institution was built on basis of intellectualism above all else, resulting in academic excellence, social justice, and giving back to the community. Through our fundraising efforts we proudly help support to Brandeis’ libraries, scholarships, and scientific research. Our members are believe in learning for the sake of learning and we do our best to satisfy that drive. We provide our members with learning and social programming though out the year through study groups and special one-time events, across a range of topics. Our study groups are designed to be fun, educational, and thought provoking. They’re a great way to spend time with friends or meet new people with mutual interests. BNC Treasure Coast recognizes our members have different interests so we provide study groups and events across a wide range of topics to ensure there is something for everyone. In past years these have included film, history, literature, interior design, food, music, Shakespeare, theater, opera, and the annual University on Wheels which is a very popular event where a Brandeis professor gives a presentation on a topic of interest. We have an exciting lineup of activities for this year that we can’t wait to share with everyone! We look forward to reconnecting with all our members, both new and returning.